The Social Subjects faculty comprises: Classical Studies, Geography, History and Modern Studies, as well as Core RE and Religious, Moral and Philosophical Studies. In S1 students follow a combined Social Subjects currently taught by Mrs. O’Neill and Mrs. Rodger. The course covers units in Map work and Weather (Geography), Jacobite and Aztecs (History) and Human Rights and Media (Modern Studies). As well as subject knowledge in these areas, pupils develop key skills such as source interpretation, literacy, numeracy, ICT, teamwork and leadership. In S3 all pupils have the opportunity to take part in an interdisciplinary learning day. This is an option for pupils in the senior phase. At both levels students study three topics: Classical Greece, Classical Literature and the Roman World. S2-S6 Geography is taught temporarily by supply teacher. Comprises of four units; Physical, Human Geographical Skills and Global Issues. In addition there is an assignment to complete which is usually field work based. Topics in the Higher course include; Lithosphere, Biosphere, Hydrosphere, Atmosphere, Rural, Population, Urban, Development and Health and River Basin Management. Comprises of three units; Physical, Human and Geographical Issues. In addition there is an assignment to complete which is usually field work based. Topics in the National 5 course include; Weather, Rivers, Natural Hazards, Health, Urban, Rural, Population and Limestone. In S2 and S3 pupils study the following topics; comparison between developed Japan and developing Kenya, Volcanoes, Earthquakes, Natural environments, glaciation, climate change and coasts. Pupils learn about aspects of culture, development and environmental issues and the impact they have on people and the environment as well as developing their skills of investigation. In S2 and S3 pupils study the following topics; World War One, Holocaust Memorial Day, Cold War, Migration and Empire, Technological changes in Britain and the Russian Revolution. Pupils learn about the causes, events and consequences of these topics as well as developing skills at being able to evaluate, compare and make judgements on historical sources. Comprises of three units; Scottish, British and European and World. In addition there is an assignment which requires independent research and planning. Topics in the course include: Scotland and the Era of the Great War, The Atlantic Slave Trade and Free at last?, and Civil Rights in the USA. Comprises of three units; Scottish, British and European and World. In addition there is an assignment which requires independent research and planning. Topics in the course include: Scotland and the Impact of the Great War, Britain, 1850-1951 and Germany, 1815-1939. In S2 and S3 pupils study the following topics; Terrorism, China, Taking Part, Africa, Democracy in the UK and Social Inequalities. Pupils learn about the impact of political, social and international events and how society reacts to these. 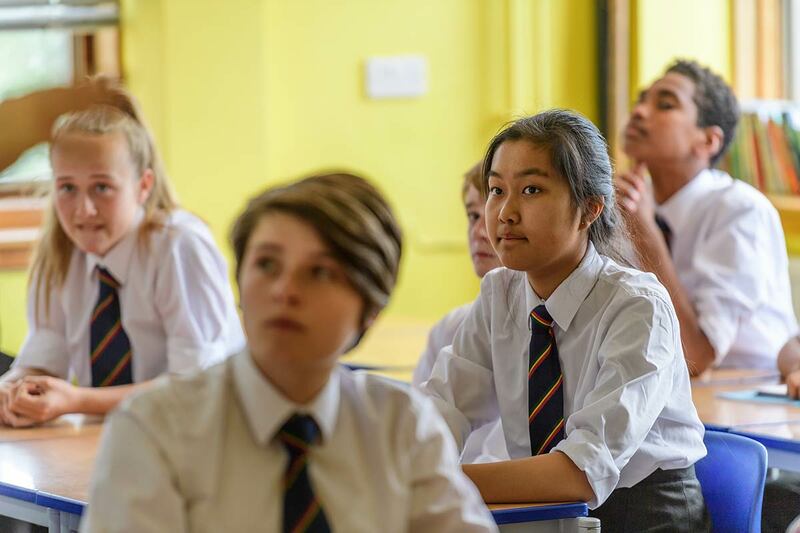 Pupils also learn the importance of keeping abreast of current events and learn key skills such as detecting bias, exaggeration, making decisions and drawing conclusions. Comprises of three units; Political Issues, Social Issues and International Issues. In addition there is an assignment which requires independent research and planning. Topics in the course include: Democracy in Scotland, Crime and the Law and the USA. P7 – S4 Core Religious Moral Education is taught by Miss Appleyard and Mr Boyd. This is a compulsory subject for all pupils from P7 to S4. The course develops from Primary 7 understandings of Christianity emerging in Scotland through to the benchmarks for S4 with its focus on sustainability and environmental and global ethics. Each year is divided into three units focusing on; beliefs, practice and tradition and values and issues. Assessments comprise of a variety of formative and summative approaches to ensure that the pupils are assessed in relation to the subject benchmarks and appropriately tracked and monitored according to their ability. The certificate classes for national 5 are taught by Mr Boyd and Miss Appleyard. These comprise of a three unit course looking at World Religion: Christianity, Moral issues: Morality and Medicine and Religious and Philosophical Questions: The Existence of God. The Higher Class is taught by Mr Boyd and follows the same format as the National 5, with a three unit division. Pupil voice determines whether morality and relationships, or morality and medicine is taught, and if we pursue Origins of Life or Existence of God. We hope to open minds to new possibilities and new perspectives which may leave us thinking long and hard about deep philosophical questions, but hopefully not as negatively as Wittgenstein!